My friend Matthew said it best after a torturous first act: “Creaky, isn’t it?” The play The Heiress is as rusty as the Tin Man, and that’s not just because it takes place (allegedly) in 1850. The more I think about what went wrong and what went reasonably well in this production of The Heiress, the more it seems I must take the director Moisés Kaufman to task. By the end of the second act we were admiring of the play’s structure, in which the daughter becomes her father. It unfortunately takes a long time for this production to get there. The play (as well as the Oscar-winning screenplay based on it back in 1949, and a Burt Lancaster film I’m fond of, Trapeze) was written by the husband and wife playwriting team of Ruth and Augustus Goetz, and based on the 1880 novel Washington Square by Henry James. Not a bad pedigree. The scenic design by Derek McLane created a performance space that can be appreciated from the steeply raked mezzanine as well as the orchestra, and it’s gorgeous as well as functional. The tastefully appointed living room of the Washington Square townhouse was lush, and atmospherically lit by David Lander with a discreet sound design by Leon Rothenberg. Albert Wolsky’s costumes are period, and the actors wear them with grace and naturalness. In fact one of the problems of the production may be the naturalistic style in which it’s played, when it’s clearly a creaky old melodrama. 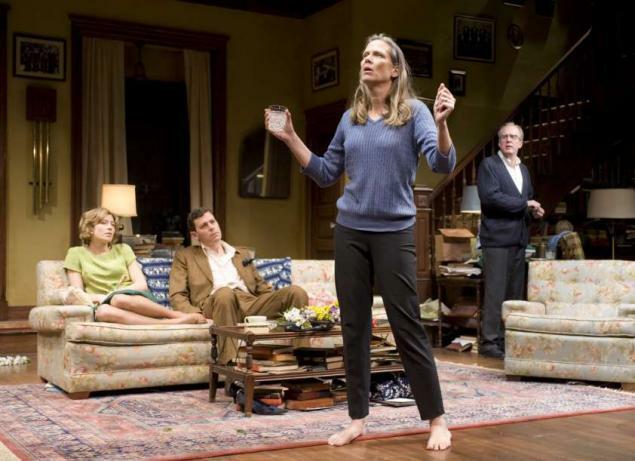 Mr. Kaufman staged the play well, but his direction of his actors and the styles of the play were questionable. In the first act, Jessica Chastain played Catherine Sloper, in an early scene with her Aunt Penniman (the stalwart Judith Ivey), as a shy but sweet and fairly normal young woman. For the rest of the first act, she played her as Temple Grandin. Her voice was more in line with her intentions in the second act, but I felt she has vocal work to do to return to the theatre — while not grating on film, her voice is unnatural onstage. On the other hand, Ms. Chastain’s physical choices made sense. She could show grace in a practiced if old-fashioned movement like a deep curtsy; she was appropriately less than graceful in her shyness and bouncing about, and later despair. But whenever she spoke, I wanted to just read the script and cut her out of it. Where Ms. Chastain’s Catherine ends up in the second act is fabulous, but where did that woman come from? Intellectually she came from the images of her held by the most important men in her life, her father and Morris Townsend. But I didn’t see that progression in her, I just know it because the play’s structure showed me. David Strathairn, whom I will see do anything, struck me as more of the decade before World War I than the decade before the Civil War, and was a rather soft variation on Dr. Austin Sloper. He was well mannered while insensitive. His daughter has minimal social skills because he hasn’t many. He only knows how to be polite — his kindness is restricted to his medical practice. Judith Ivey is (Aunt) Lavinia Penniman. Dr. Sloper’s widowed sister, married for many years to a Reverend, is an absurd romantic with a practical streak, and Ms. Ivey’s portrayal is an utter delight. It is she, rather than Catherine, that Mr. Townsend romances so very well, and her scenes with Morris are a pleasure — she knows what he’s doing but enjoys him too much to be concerned. After all, every man has some flaw. The audience would know neither Catherine nor Austin Sloper were it not for Lavinia’s incessant chatter that annoys them enough for them to show us their true colors. My favorite performance is a tie between Ms. Ivey and Caitlin O’Connell, who played the doctor’s other sister, Mrs. Elizabeth Almond. We meet “Aunt” Liz at the same time as we meet her daughter — Catherine’s cousin — Marian Almond (played with a warm and lively manner by Molly Camp), who is engaged to marry Arthur Townsend (a dull fellow well played by Kieran Campion). Ms. O’Connell’s Liz is warm, clever, practical, yet still shares some of her giggly sister Lavinia’s everlasting hope. The Almonds bring along Arthur’s cousin several times removed, Morris Townsend, just back from Europe where he learned to love fine things. The Sloper house is fine in itself and filled with beautiful things, consumable and not. This handsome young man was played by Dan Stevens, who sounded like good casting for the role. However, he had better chemistry with Ms. Ivey than with Ms. Chastain, so at no time could the audience feel this was a romance thwarted. We always knew Dr. Sloper was right about that fellow. While Mr. Stevens’ work on Downton Abbey lead us to believe he could handle old-fashioned, formal language, Morris Townsend’s words sounded stiff. Virginia Kull did good work as Maria, the Slopers’ loyal maid, with true affection for the members of the household she serves. We didn’t see Ben Livingston, we just heard him as the voice of the coachman from across the square; yet we appreciated his fine work as we heard his despair when his needs were not met. Dee Nelson brought hope onto the stage then left it behind as Morris’ widowed sister, Mrs. Montgomery. Her affection for her brother is not blind, and while she starts the scene with anticipation of a good match for him, she sees the bleaker future when she meets Catherine. This scene in particular makes Dr. Sloper seem much crueler than Mr. Strathairn plays him. Clearly Mr. Strathairn sees Dr. Sloper as a man who cannot be less than honest, although he is unfailingly polite. What he sees as flaws in his daughter are the shields she has created to protect herself from his cold gaze. The problems of this production are fourfold. 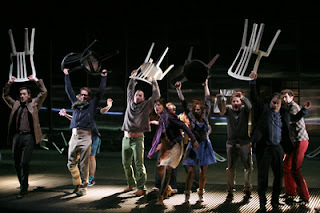 The play creaks with stiff language despite a solid structure. Melodrama doesn’t play awfully well in this century, especially when more than half the cast are playing it naturalistically. Dr. Sloper was rather too soft. Ms. Chastain ‘s choices, while consistent, seemed to imply that Catherine Sloper’s personality issues were mental instead of emotional, so her transformation in the second act did not follow. There was no chemistry between Ms. Chastain’s Catherine Sloper and Mr. Stevens’ Morris Townsend. There can be no heartbreak — for Catherine alone, of course — without love. This The Heiress had far more laughs and chuckles than I would have expected. I enjoyed several performances and recognized the quality of the play, but wondered what the production with Cherry Jones several years ago might have looked like. ~ Molly Matera, signing off and sighing in disappointment. Last week, the compact traveling production of Hamlet from Shakespeare’s Globe was quite entertaining and unlike any Hamlet I’ve ever seen. That said, was it Hamlet? It didn’t feel like Hamlet, although it was certainly Shakespeare. The language, rapid-fire and musical, was intellectually challenging, and, by virtue of the words themselves and the rhythm of the lines, emotionally fraught. But were the characters? The play opens with song, Laura Forrest-Hay’s music performed by the eight actors who portray all the characters in the script. 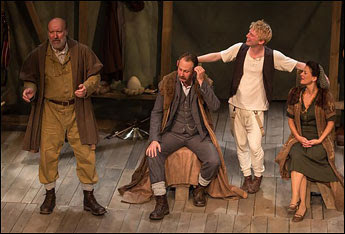 Artistic Director Dominic Dromgoole co-directed the play with Bill Buckhurst on a tight, clever set by Jonathan Fensom, who also designed the versatile costumes. 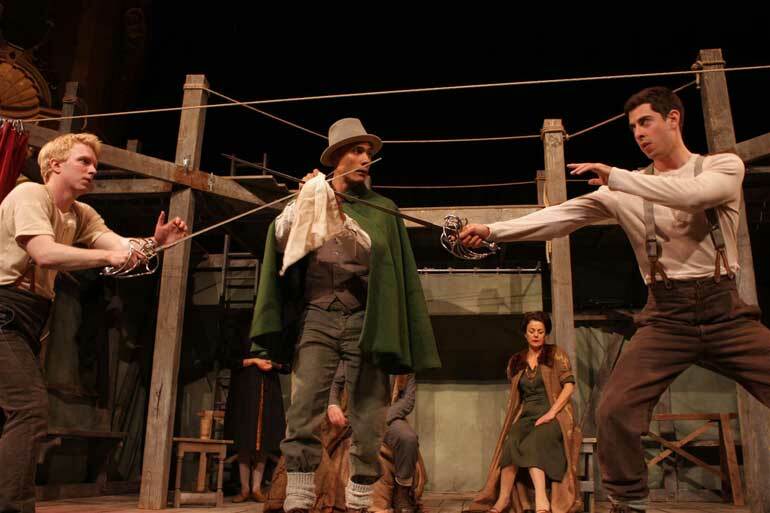 The spitfire Hamlet of this production was Michael Benz, a very young man in whom we could see all those things the play says Hamlet was wont to embody — courtier, scholar, etc. Mr. Benz articulated the brilliance of Hamlet, rather like a teenager whose genius was appreciated before but no longer, not under the reign of the usurper. This boy is hurt, rather frightened, and still responds with immaturity to much that occurs around him. Which comes off quite funny. The lines of the play have always shown us that, but Mr. Benz gave us more of the young man’s brash uncertainty than the older actors to whom we are accustomed. This Hamlet was a stranger in a familiar land. Tom Lawrence played the grounded best friend, Horatio, with warmth and humor, and lent life and reality to his other charges, Reynaldo and the Norwegian Captain. Peter Bray gave equal weight to his portrayals of Rosencrantz, Osric (witty and swell), and Marcellus, although his Fortinbras was not as well defined. Matthew Romain plays a fine fiddle, a sensitive and loving Laertes, and a Guildenstern with some depth. Benz, Bray, and Romain, Miranda Foster in the background. (c) 2012 Fiona Moorehead. Christopher Saul was grave as both Polonius, who didn’t talk nearly as much as usual, and the Gravedigger in a greatly shortened scene. Dickon Tyrrell did good work as the Ghost of Hamlet’s father and the usurping Uncle Claudius, his characters clearly differentiated. While his lively First Player and Player King were quite delightful, playing all those roles did require some suspension of disbelief from the audience, particularly during the cleverly curtained scene changes surrounding the play within the play. Miranda Foster played Gertrude rather as a fishwife, braying her tears and fears. Mind you, in this shortened version of the play (I wish I could see the actual script), Gertrude did seem to have been given short shrift. Carlyss Peer played Ophelia as a country girl, strong, not too bright, which was fine in the first half, but not so much in the second. Her mad scenes did not come off as a girl deranged by loss but rather as acting exercises. Hamlet and Ophelia. (c) 2012 Fiona Moorehead. Sometimes, despite the skill of these players, it almost seemed like a production of youngsters, perhaps because most of the players seemed to be physically slight in comparison to the blatant adult males — Saul’s Polonius/Gravedigger and Tyrrell’s Claudius/Ghost, both men much taller than the other players. Must give us pause. While the set was fabulous and imaginative, the upper portion was barely used — primarily when Hamlet “hid” Polonius’ corpse and when he returned from his sojourn with the pirates and tells Horatio the tale. 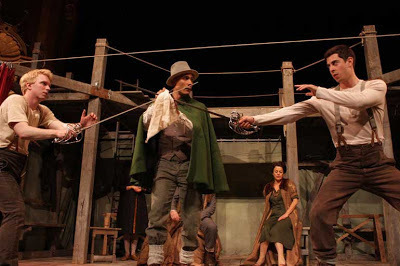 Unfortunately at the time they were upstage of the people clearing the stage (rhythmically, artistically) of the graveyard scene, so it was easy to miss what Hamlet had to say about Rosencrantz and Guildenstern et.al. Polonius, Claudius, Hamlet, and Gertrude. (c) 2012 Fiona Moorehead. The humor in the play was at the forefront here — perhaps that has to do with speed — and the musical opening, interludes, and closing were jolly. And, of course, there was time for them since you cannot tell me that the text workers (they’re not called dramaturgs in the program) didn’t cut quite large swathes out of the script. The play wasn’t a mere 2 hours 40 minutes just because Hamlet spoke so fast. It’s been cut and cut and cut, and while the result was not precisely a new play, it’s a different version. Back to my earlier question: Was it Hamlet? It was not a tragedy, nor was it emotionally engaging. Well, it was a “Wee Hamlet.” All in all, a flawed but enjoyable afternoon at the theatre. While the New York run has ended, the production also plays Boston and the West Coast. See it if you have the opportunity. ~ Molly Matera, signing off to re-read the play. The long version. The Theatre de la Ville (Paris)’s production of Ionesco’s Rhinoceros played for three nights at the BAM Opera House last week. In Rhinoceros, Ionesco’s main character — a sad sack hung over Everyman named Bérenger — watches his fellow villagers one by one become mindless, soulless beasts, of their own free will. Tomes have been written about the meanings of this allegorical staple of the absurdist theatre. This production won’t help you understand them. Somehow it’s much easier to watch French film than French theatre — the superscript changer had trouble keeping up with the very brisk French being spoken and, all too often, shouted onstage. Director Emmanuel Demarcy-Mota had his entire cast at the same level — loud — from beginning to end, so there wasn’t much of a big deal, aurally, as they became rhinoceroses. The first act was just flat — I seriously thought the director had no depth perception — barely introducing Ionesco’s main character, Bérenger as played sweetly but dully by Serge Maggiani, before the shouting began. Bérenger’s friend, Jean, as played by Hugues Quester, was an annoying Johnny One Note. An intervention that consists merely of denigrating the subject — Bérenger — is not interesting theatre. When the actors and designers let us know something rather large, heavy, and unusual was running by, it could as easily have been a tank as a rhinoceros. The second act had some fun contributions from the scenic designer (Yves Collet), and that helped the actors engage since they were physically discombobulated by floors rising (shades of Titanic). As humans slowly changed to rhinoceroses, their physical interpretations of the change were quite interesting, starting with the loud Jean. Unfortunately his standard bellow did not help the audience to know when his transformation was beginning. Still, it’s an effective scene, with Bérenger doing his best to distance himself from his frightening friend. Bit by bit, the entire village turns, although we only witness two more: Bérenger’s colleague (and rival in love) Dudard (Philippe Demarle) and his dreamgirl Daisy (Céline Carrère), who both make the transformation from human to rhinoceros appear more lightening than weighty, as if the simplicity of following indiscriminately is communicated to their bodies as well as their minds. 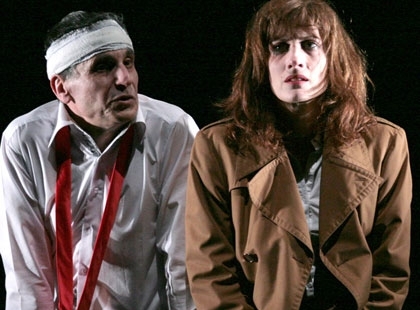 Serge Maggiani as Berenger and Celine Carrere as Daisy. (c) 2012 Jean Louis Fernandez. The closing moments of the play are quite effective, when Bérenger is truly alone and determined not to join the pack of his lazy-minded compatriots, without showing a definitive resolution. But the director’s best idea was not from the play. The evening began when Serge Maggiani spoke a prelude in front of the curtain that was an excerpt from Ionesco’s only novel, The Hermit. This was a really good idea, featuring similar themes to those that would follow in Rhinoceros. However….the rest of the production let us down. I’m sticking with the late actor/director/teacher Herbert Berghof’s “golden words” on this one. That is, if you shout, you’d better have a damned good reason. ~ Molly Matera, signing off to re-read the play. En anglais, s’il vous plaît.